The formal entrance to Banff - very near the short but beautiful Fenland trail. 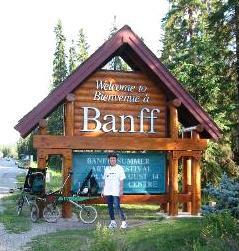 Banff is in the heart of the Canadian Rockies - magnificent mountains, lakes, the beautiful Bow River and hot springs. Banff has it all. Our friends John and Joan brought us to the Seymour Road bike path - probably the most beautiful that we have come across. 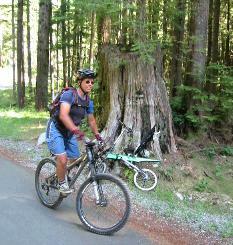 Here we see Joan balancing in front of a large tree stump - a reminder of the days when these magnificent old growth trees were harvested. 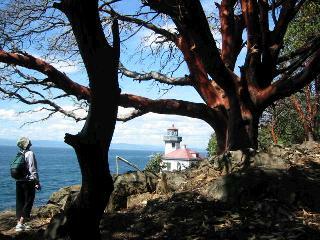 A bicycling paradise with a 50 mile perimeter - so much to do and see - we were introduced to sea kayaking, whale watching, wonderful scenery, and the weird red Madrona trees which shed their bark so as to continue photosynthesis through their naked red wood. 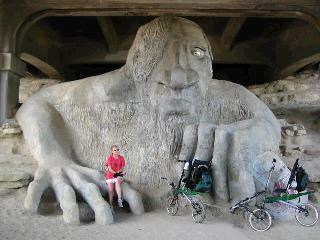 The Burke-Gillman trail in Northern Seattle is 29 miles one way, passing through "Funky" Fremont (with wonders such as the freindly giant Troll crushing a full size VW Beetle under the I-99 overpass), the Washington University, along the beautiful lakeshore homes of Lake Washington, and all the way to Lake Sammamish. Boulder is an urban bicycling paradise - the entire city is networked with dedicated bicycle paths and bicycle lanes. 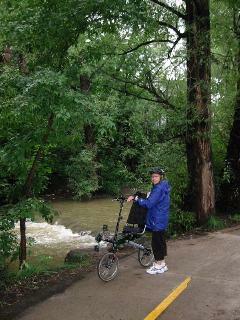 The picture shows Nili on the beautiful Boulder Creek path which cuts straight through the downtown area. Boulder residents are very proud of their >300 days of sunshine per year, so why is Nili wearing raingear in mid August?